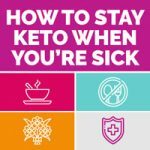 It is possible to stay in ketosis when you’re sick, whether you’re dealing with a stomach bug or fighting off a cold — and in some cases, sticking to your diet can help you recover faster! Being sick makes it harder to stick to any diet. You’re feeling lousy and you want to indulge in some of your favorite comfort foods. That’s even harder when you’re on the Keto diet, as many of the medications you take throughout the process may leave you feeling worse than before and erase all the work you did to get into ketosis in the first place. 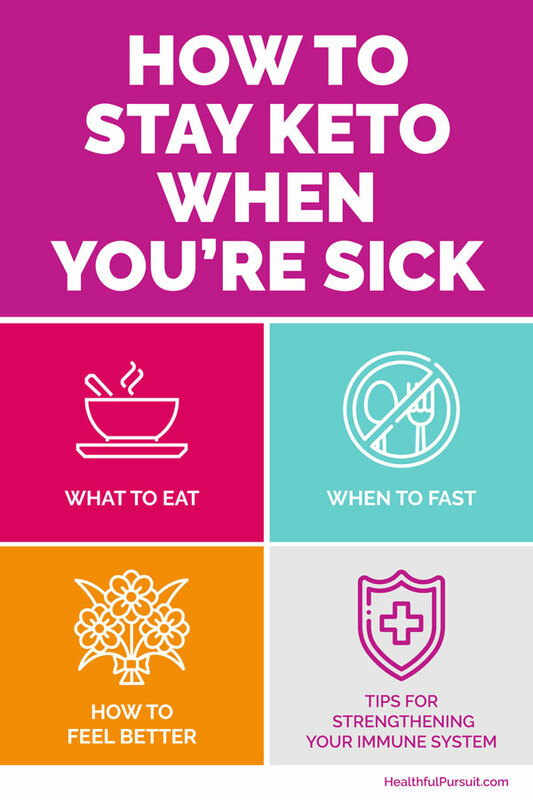 Fortunately, it is possible to stay in ketosis when you’re sick, whether you’re dealing with a stomach bug or fighting off a cold — and in some cases, sticking to your diet can help you recover faster! 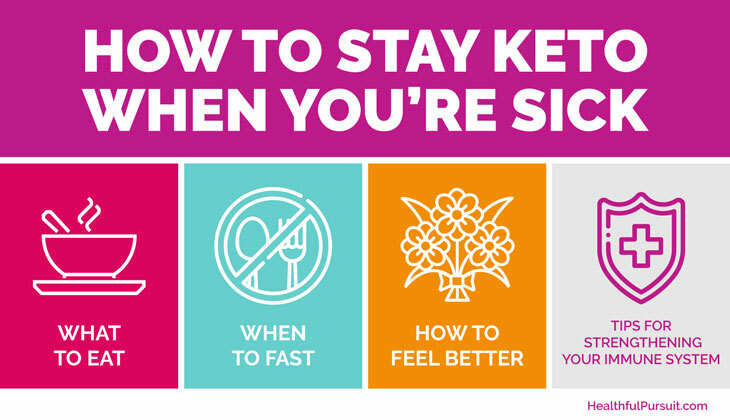 If you feel an illness coming on, make sure that you’re prepared to deal with it while remaining in ketosis and continuing to reach your goals. A recent bout with the flu left me with the chance to see this firsthand — and I managed to kick this flu bug to the curb with natural remedies and liquid-only fasting. When you have a fever, fasting can be one of the most effective mechanisms for helping your body heal — especially depending on the type of infection you have. According to a small study 1 fasting can help substantially promote healing from bacterial infections, while eating the right types of foods can help your body heal from viral infections. A previous study on mice with bacterial infections supports this evidence: mice who were force-fed were less likely to recover from bacterial infections in a timely manner, while mice who were allowed to eat according to their appetites had more positive outcomes. Of course, that doesn’t mean that you have to fast the entire time you’re sick, either. For the most part, the benefits of fasting are limited to the most acute days of the infection, when your fever is highest. Currently, there aren’t human studies that have examined whether or not fasting has a strong effect on recovery from the common cold or flu — but there are several ways in which fasting can be beneficial throughout the recovery process. Fasting forces your body to rely on stored energy to take care of normal daily processes. This may help speed metabolism and help combat the infection more effectively than even many of the medications you often take to help fight off cold and flu symptoms. If you don’t want or need as much food to fight infection, you don’t have to hunt or gather. This means that your body can concentrate fully on the recovery process, rather than needing to expend more energy or lose heat on the hunt for food. Decreasing food intake removes some of the nutrients the infection needs to grow and spread throughout your body. Many infections thrive on the iron and zinc contained in the food you’re eating, so decreasing their consumption may limit spread of the infection. Lack of appetite encourages your body to remove infected cells through cell apoptosis 3 in which cells that aren’t useful to your body or that may be a threat to it are eliminated. Using stored fats produces ketones that may be highly beneficial to your immune system. One particular ketone, beta-hydroxybutyrate (BHB), has been observed to offer particular benefit to the immune system. Researchers at the Yale School of Medicine 4 exposed human immune cells to BHB in the amounts you’d expect to find in the body after two days of fasting, which results in a reduced inflammatory response. Since you’re already in ketosis, you’re in an ideal place to overcome the flu, fever, or a cold, since you’re already producing those ketones. As a result, you may find that your symptoms are reduced and you aren’t dealing with illness as long as someone who didn’t start off in ketosis. Fasting for 48-72 hours promotes recycling of damaged immune cells. In fact, fasting for just 72 hours can regenerate your entire immune system 5 — a huge boost when you’re trying to fight off illness or infection in a hurry. It’s important to understand that right now, there’s not a solid understanding of exactly how fasting has the potential to affect the human immune system. More studies are still needed in order to determine how treatment for cold, flu, and other illnesses needs to shift in order to provide more effective treatment. That doesn’t mean, however, that you can’t take advantage of the current availability of knowledge to improve your outcome when you’re sick. You’re showing signs of getting sick. You’re already in ketosis, which means that your body is producing many of the ketones that can help you get healthy again faster. Whether or not you’ve decided to fast through your illness, there are several natural strategies you can use to help you heal faster. Note that you don’t have to follow all of these suggestions; instead, try the ones that seem to be the most effective for your body or the ones that are most appealing to you. Drink lots of water! This will help flush out your system and aid in your recovery. Sip some warm bone broth, which may be comforting and help you recover. Add lemon and ginger to sparkling water to add an immune boost or help steady an upset stomach. Warm some coconut milk and add reishi mushroom powder. Add electrolyte powder to your room-temperature water. Note that while you’re fasting, you should not drink coffee! Instead, rely on these natural beverage options to help aid in your recovery. Of course, diet alone won’t help boost your body to a full recovery. To help improve your chances, make sure that you’re following some of these tips. Get lots of sleep. When you’re sick, sleep is one of the most effective things you can do to help your body get better. Mix eucalyptus essential oil with coconut oil and rub it on your feet. Cover your feet with socks, then head off to sleep. Take probiotic supplements to help boost your recovery. Relax in a warm bath with Epsom salt and a few drops of peppermint or lavender essential oil. This will help soothe and relax your body as well as aid in recovery. Wear loose-fitting clothing and cover yourself in a comfortable blanket, even though you may be hot. Keep a fan running and a window open in your bedroom to aid in air circulation. Living with a sore throat is uncomfortable as well as inconvenient. Fortunately, there are several natural remedies that can help aid in easing your pain. Add a couple of drops of oregano oil to a glass of warm water. Gargle, then spit it out. Add Himalayan salt to a glass of warm water and gargle. Melt coconut oil, then add lemon, myrrh, oregano, cypress, and frankincense essential oils. Rub it on the outside of your throat like a massage. This can be incredibly soothing and ease your pain! Drink tea with soothing herbs. Use a throat spray that contains olive leaf and peppermint. If you spray it directly on the back of your throat, it can ease the pain within seconds! Use colloidal silver spray directly on the back of your throat. Nausea can ruin your day — even when you think you’re on the road to recovery. Grating fresh ginger and adding it to a cup of hot water, then drinking it, can help soothe your stomach and make you feel more like yourself. The muscle pain that comes along with illness can be one of the most frustrating symptoms! A 90-minute lymph drainage massage with a massage therapist — once you’re no longer contagious, of course! — can help ease much of that lingering pain. You can also do it yourself 6 for relief in the moment. Spending time out in the sunshine, especially when you start to feel a little better. Just 15 to 20 minutes can help you feel much more like yourself! Jump in the sauna once you no longer have a fever. It’s time to say goodbye to the flu, sore throat, and aches and pains. Instead, say hello to deeper Keto than when you got sick! Instead of kicking your diet to the curb, embrace all of its advantages. I found that being sick actually helped me achieve a deeper level of Keto so that when I got better, I got to experience all the benefits even more than before.